It’s finally spring, the weather is warming up, and wildflowers are starting to bloom. While part-time RVers are beginning to kick off their camping season, it’s also the time of year when bees and wasps become more active. These are some of the ways you can prevent them from buzzing around your campsite, or worse, nesting in places like your RV’s furnace vent. The best way to keep bees and other insects from getting inside in the first place is by covering up all exterior openings where they could enter. A furnace cover prevents bees, spiders, and other insects. Get yours on Amazon. 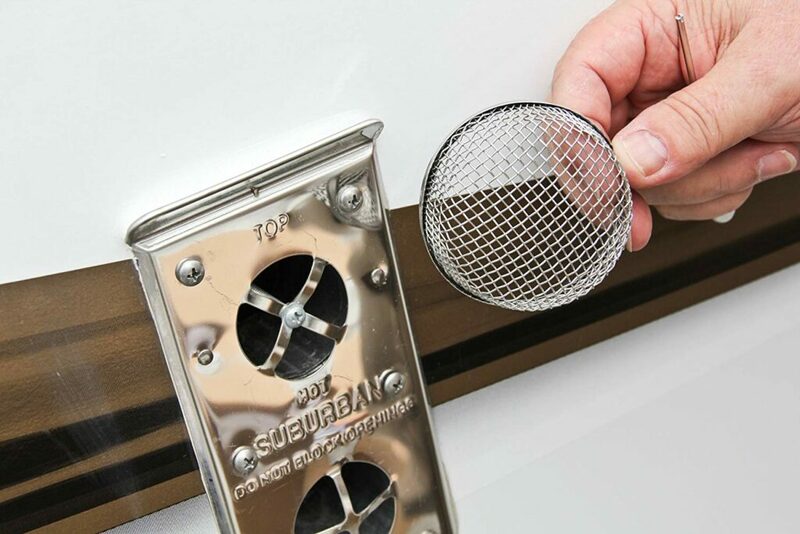 Mesh covers are available in stores and online for your RV furnace vent, fridge vent, water heater, and rear bumper. Installation can easily be done in ten minutes or less with the included tools. Make sure your window screens are intact as well, so you can let in the breeze without all the bugs. Check out this article for a step-by-step guide on replacing the screens. Most people already have a can of this stuff lying around for its many other purposes. WD-40 is also effective in killing and preventing wasps around the home and RV. Spray some WD-40 around all of your RV’s vents to help keep wasps from nesting. Bees are attracted to the smell of propane, and your RV’s gas appliances can emit just enough of the odor to draw the bugs in. Regularly inspect all of the gas appliances in your RV, including the furnace, water heater, and fridge. If you do spot a nest, search online to find a beekeeper in your area. Some beekeepers charge a fee, but others will remove the nest for free, especially since honey bees are going extinct. It’s less work to worry about, and you’ll save yourself from getting stung. If you plan on taking care of the problem yourself, use a long stick to carefully remove the nest at night. Wear long-sleeved clothing with heavy fabric and secure the ankles of your pants with string or tape. Bees love nectar for its sweetness, so it’s only natural they’re going to buzz around your picnic if you have sugary sodas, fruits like pineapple or watermelon, and other desserts sitting outside. Open beer and wine can also lure bees to your campsite. We just left for a trip from Colorado to Texas. Our furnace will not work. I have been troubleshooting and the Suburban people told me to remove these covers because they restrict air flow and will void my warrantee . So I put them on last fall, removing them now. You’ve got something else going on. And someone from Suburban is telling you fish stories! Today I picked up my RV from Arlington Supercenter after having some for some warranty work completed. They removed the cover from my furnace intake/exhaust port and told me it would void the Suburban warranty. Arlington was the parts place that sold them to me. I contacted Suburban and they verified this. I have been using them for 20 or more years with no problem so I feel confident there was never an issue with restricted air flow. Also, never had a rodent in any of my campers = ever. I’ll just have to remove the cover before bringing it in for service. What he said. Those screens block some double digit percentage of the air going into or out of your furnace. I’ve got a better idea. Buy a can of wasp spray and spray the nests. $2.98. NOT A GOOD IDEA, YOU WANT THEM TO BE STOPPED BEFORE THEY GET IN THERE AND A BUILD A NEST. The appliance manufacturer must be consulted before fitting anything to a vent. Most manufacturers will not approve of their use. In that case, temporary covers should be considered. A sink drain filter can be used on the furnace vents. From Walmart and a lot less expensive. I’ve heard you just hang a pet flea collar in each compartment and it keeps spiders and bees away…. no covers necessary. Having been a RV Tech for 4 1/2 decades, I have heard many variations of this debate. Suburban and Dometic both feel it is an air restriction for their furnaces, so I did the air flow testing. It does restrict the intake and exhaust on both, with the Atwood/Dometic being effected the most. But the screens are a good idea. So when you take your camper out in spring, put screens on the furnace. In the winter, if you are using the furnace, take them off. Refrigerators are a totally different story. If you have a Norcold refrigerator, in a slide out, the screens will destroy the cooling unit. With the screens installed out test machine ran 20-25* warmer, inside, with the screens. Without them, the freezer would get down to temperature overnight and the lower box was within minimums. If the fans were running. Don’t press your luck with the refrigeration in your unit.